I had a block of Parmesan cheese, so I grated it in the food processor first and then dumped it out to measure it. If you have grated Parmesan already, you can skip that step! Toss in pine nuts, a clove of garlic, and salt and process to chop them together. 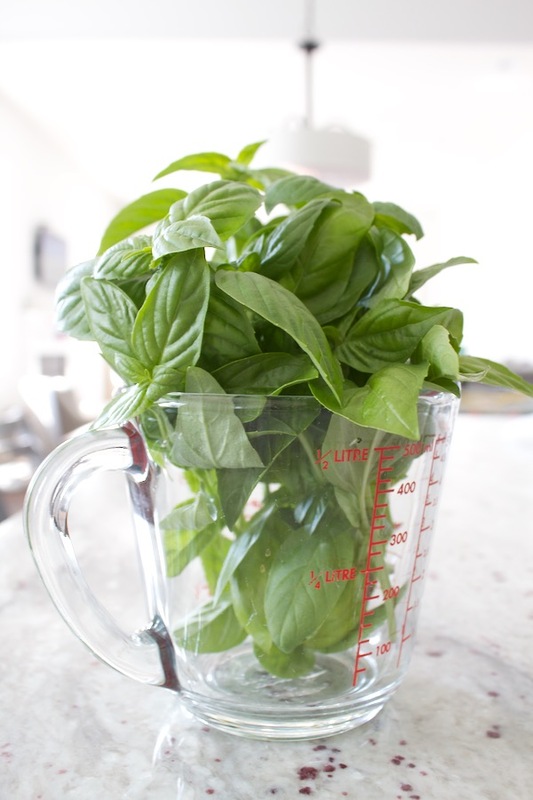 Add the basil and Parmesan cheese, then stream in the olive oil as you pulse it together. This Cuisinart food processor was my mom’s, and it’s like 30 years old. Still going strong. That’s my baby’s little hand ready to push All The Buttons, except now she’s not my actual baby, she’s my middle baby! And there you have it! 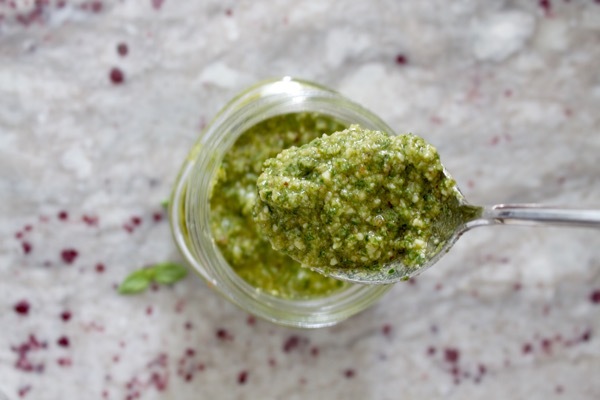 Beautiful, fresh, salty, garlicky, pungent basil pesto. Please have a loaf of crusty bread available for taste testing purposes! I love to chunk up a loaf of airy, chewy ciabatta and dip it straight into a bowl of pesto, or toast up slices of baguette and smear it on top like butter. Or you can go all out and make this super easy no-knead bread to pair with your pesto! Basically, you can’t go wrong in the bread + pesto department. I’m still grieving the fact that I had no bread and had to do my salt-level taste test with week-old pita. (It was actually still delicious, which speaks to the magical powers of basil + garlic + Parmesan + olive oil.) 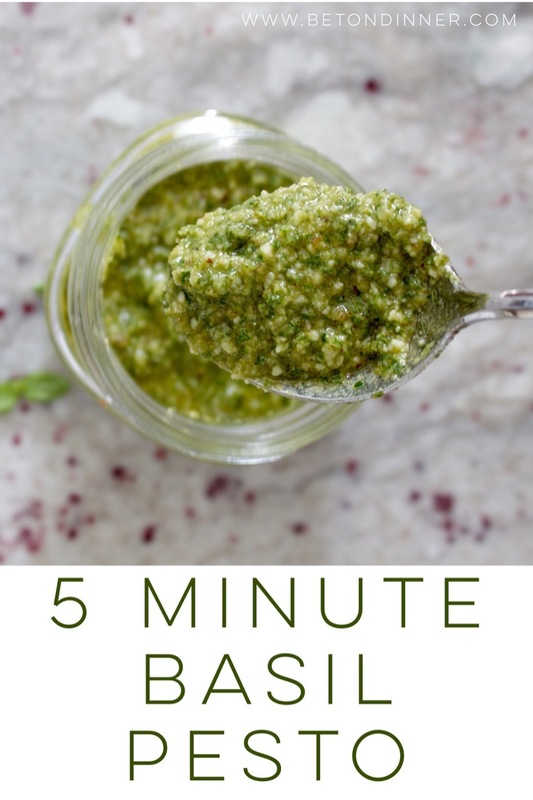 Later this week (um, ha, or sometime in the future – 3-week-olds are unpredictable bosses, man) I’ll share our favorite pesto pasta, and some other pesto inspiration! Add pine nuts, garlic, and salt to the bowl of a food processor and pulse to finely chop. 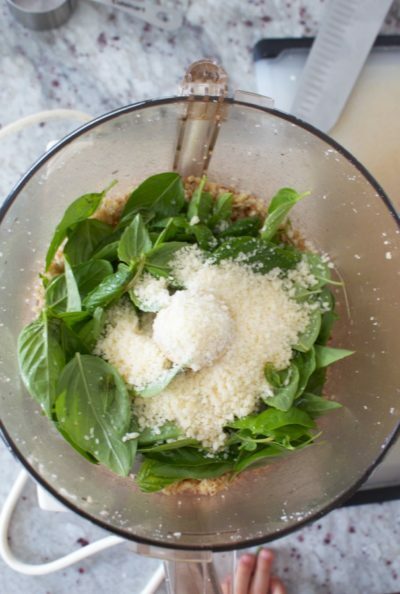 Add basil and Parmesan cheese and process while streaming in the olive oil until it’s all finely chopped and fully combined, scraping the sides of the food processor bowl if needed. Taste and add salt if needed. Serve as an appetizer with bread to dip in the pesto, or smeared on toasted bread slices, or as a pasta or pizza sauce. The possibilities are endless! I use toasted pine nuts – if yours aren’t, you can briefly toast them in a dry skillet over medium heat until they’re fragrant (3ish minutes). Pine nuts are expensive, but you can get the small amount you need from bulk bins and not have to shell out much money! You can also substitute walnuts or pecans. I really love the taste of pine nuts for this pesto, though. This recipe is adapted from Simple Pesto by Twinks on Tasty Kitchen. I reduced the amount of garlic since I find the full amount a bit overpowering. 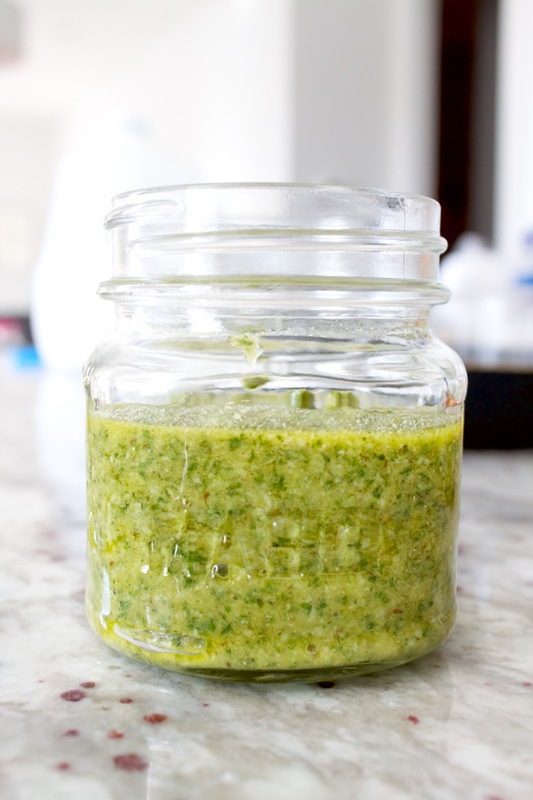 I store leftover pesto in a jar in the fridge with a little olive oil drizzled over the top. The color darkens over a few days but it still tastes great! I’ve never had my pesto last long enough to freeze, but “they” say you shouldn’t freeze it with the cheese. So if you want to freeze your pesto, wait to stir in the cheese after defrosting!